The revolutionary design of Allure of the Seas will fill your days at sea with wonder: wake to two-storey ocean views in thecontemporary Loft Suites, hop onto a classic, full-sized carousel in our Boardwalk neighbourhood, spend some quiet time in the adults-only Solarium and let the children's imaginations run wild in the Youth Zone – the largest dedicated youth area at sea. Jump right into the Pool Zone, where you'll find the H2O Zone, cantilevered whirlpools, FlowRiders® and a thrilling zip-line view of the ship and sea below. When it's time to unwind, go for a stroll in Central Park – a meandering garden and lush public space lined with foliage and fine restaurants – or take in the majestic view from any of the multiple balconies overlooking the AquaTheater, the first amphitheatre at sea. With 28 ultra-modern loft suites and 2,700 spacious staterooms, this 16-deck marvel proves that the impossible is possible. You have to see it to believe it. sq. ft. Balcony: 82 sq. ft.
Two twin beds that convert to Royal King, sitting area with sofa, full bathroom and private balcony. Stateroom: 182 sq. ft. Balcony: 75 sq. ft.
with table and chairs. Stateroom: 673 sq. ft. Balcony: 610 sq. ft. Bedroom area with two twin beds that convert to Royal King. One bathroom with tub, large closets, sitting area with table and sofa bed. Private balcony with seating area and private dining. Stateroom: 421 sq. ft. Balcony: 126 sq. ft.
Grand entrance exposes lofty views two-deckshigh.Single-floor suite with doorbell has dining room with dry bar and entertainment center,living room with sofa bed, and guest bath with shower. Master bedroom has a King size bedwith Duxiana Mattress and sitting area, master bathroom with tub, shower, two sinks andbidet. Private balcony with jacuzzi. Sleeps up to 4. Stateroom: 914 sq. ft. Balcony: 161 sq. ft.
- Bedroom area with two twin beds that convert to Royal King.Full bathroom with tub and two sinks. Living room with sofa that converts to double bed.Private balcony with seating area and private dining. Sleeps up to 4. Stateroom: 371 sq. 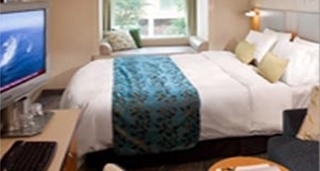 ft.
Two bedrooms with two twin beds that convert to Royal King,two Pullman beds. Vanity with chair in each bedroom, living area with double convertible sofa, marble entry, entertainment center, two bathrooms - master bath with tub. Private balconywith table and chairs. 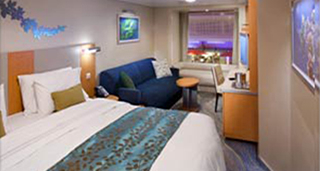 NOTE: Grand Suites on deck 12 have have a jacuzzi in the private balcony.Stateroom: 580 sq. ft. Balcony: 238 sq. ft.
- Two-decks-high stateroom with panoramic views. Masterbedroom with Royal King size bed and bath on second level. Bath with shower on main level.Private balcony with chairs, dining area with dry bar, table/desk. Living room sofa converts todouble bed. Stateroom: 545 sq. ft. Balcony: 114 sq. ft.
Grand entrance exposes lofty views two-deckshigh.Single-floor suite with doorbell has dining room with dry bar and entertainment center,living room with sofa bed, and guest bath with shower. Master bedroom has a King size bedwith Duxiana Mattress and sitting area, master bathroom with tub, shower, two sinks and bidet. Two twin beds that convert to Royal King. Private bathroomwith tub and two sinks, marble entry, large closets, living area with table and sofa. Privatebalcony with table and chairs. Stateroom: 556 sq. ft. Balcony: 243 sq. ft.
Two-decks-high stateroom with panoramic views. On second level, master bedroom has a King size bed with Duxiana Mattress; bathroom with tub, shower, two sinks and bidet and a closet. On main level, second bedroom with closet and two twin beds that convert to Royal King; dining area with dry bar, living room with sofa that converts to double bed; bathroom with shower. Private balcony with whirlpool and dining area. Sleeps up to 6 guests. Stateroom: 1,524 sq. ft. Balcony (main level): 843 sq. ft.
- Two-decks-high stateroom with panoramic views. Master bedroom andbathroom on second level. Bedroom has a King size bed with Duxiana Mattress. Stairway tosecond level. Bathrooms with shower for two. Private balcony with dining area. Dining area with dry bar. Living room sofa converts to double bed. Closets on each level. Stateroom: 722 sq. ft. Balcony: 410 sq. ft.